Long renowned for its scenic beauty, New York's Finger Lakes region has recently become known as a food destination as well. Thanks in large part to the farms and wineries in the area, an ever-growing number of high-quality restaurants are offering many styles of food, from rustic delights served on picnic tables to complex creations rivaling those found in the best big-city establishments. The expanding range of the area's cuisine is on display in a new book, Finger Lakes Feast, from McBooks Press, an Ithaca publishing house headed by Alex Skutt '70. The 224-page hardcover volume, written by Karl Zinsmeister and his daughter, Kate Harvey, presents more than 100 recipes and dozens of large color photographs, most of them taken by Noah Zinsmeister, Karl's son. It also puts this culinary explosion in context, covering the history of Finger Lakes food, highlighting key contributors, and citing the crucial influence of Cornell. "Cornell specialists have had a leading role in many food and agriculture breakthroughs," write the authors, "[including] creation of popular apple varieties, hybrid grape breeding, innovations in animal husbandry, important research on dairy products, a viticulture and enology program, hydroponic testing, running food labs, developing new cooking and processing technologies, consulting on ecological issues, and seeding its graduates through the region—where many of them have founded farms, vineyards, food-manufacturing companies, and restaurants." Finger Lakes Feast offers highlights of the area's cuisine in five categories—breakfasts, soups and appetizers, main dishes, salads and side dishes, and sweets—and includes tips on how to find the best comestibles, from apples to yogurt, as well as contact information for the contributing restaurants. "So do grab the moment," write the authors, "give yourself and loved ones a burst of primal sensation, and come feast!" Finger Lakes Feast is available at bricks-and-mortar and online bookstores; it can be ordered by phone from the Independent Publishers Group (800-888-4741) and at the McBooks Press website (www.mcbooks.com ). 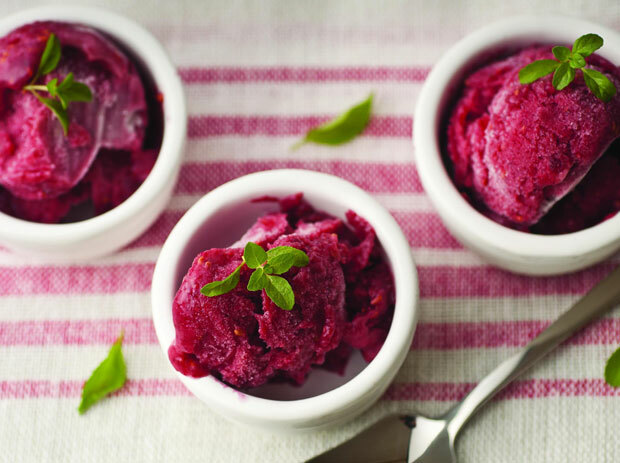 An unusual wine sorbet with real raspberry tang, and a nice wine secondary taste. Note that this is not smooth and processed, but country-style chunky, with lots of raspberry pulp and seeds. Stir the sugar into the hot water to mostly melt it. Mash the raspberries up a bit with a large fork or spoon. Mix all ingredients and freeze in a home ice-cream maker. Because of the wine, this will not freeze as fast or as hard in your maker as some sorbets. If you want to serve it right away, it may be soft, so to prevent fast melting present it in bowls you've chilled in the freezer. Or pack it into a tub with a tightsealing lid and place in the freezer, where it will get fully hard.